Halloween brought Michael Myers back to his hometown roots by wiping out all the previous sequels between the 1978 original and the 2018 rebirth. Now, the Leprechaun legend plans to do the same with a new sequel that forgets everything that came in-between it and the 1993 original starring Jennifer Aniston. 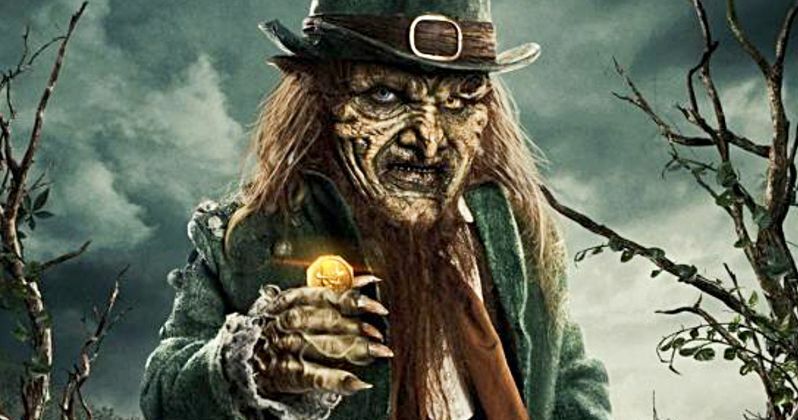 Where some of the installments got downright goofy, Leprechaun Returns appears to be a true horror movie laced with twisted comedy and a whole lot of delicious gore. Jennifer Aniston might not be back, but Mark Holton, who played Ozzie in the original (and is perhaps best known as Francis in Pee-wee's Big Adventure) is, and he looks ready to play. The first movie left the Leprechaun at the bottom of a well. Perhaps everything else in all those old Leprechaun movies was just a dream, as this horror icon awakens with a rejuvenated spirit and an even wickeder sense of mayhem. Leprechaun was never the biggest force in the horror movie universe. But he sure is returning with a vengeance. This will be the Irish creature's eighth run, with Leprechaun Returns set for a December 11 release. The movie features Channel Zero: Butcher's Block star Linden Porco in the lead as the money obsessed monster who delights in killing 'green' minded teenagers. They don't just wear green on Saint Patrick's day. They're going completely green. The Sorority Sisters of Alpha Upsilon want to use the old well as a pure water source. In making the move, they accidentally awaken the pint-sized maniac who has been trapped at the bottom ever since Jennifer Aniston put him there way back in 1993. There is a pot of gold buried under the old sorority house. And The Leprechaun wants it desperately. To retrieve it he must recover his powers, and to do that, he must go on a nasty killing spree that looks like it has been pulled right out of one of the earlier Final Destination movies. Yes, there will be blood. Lots of it. Only the girls of AU can stop the crazy creature from obtaining his goals. The man behind such recent cult favorites as Manborg and The Void, Steven Kostanski is back on the horror scene to direct this franchise continuation. Joining Mark Holton in the cast is Taylor Spreitler, who plays Lila. Entertainment Weekly has released the first trailer and a poster showing the Leprechaun in all his glory. It's a devilish bit of fun. Leprechaun Returns was originally being set up as a Syfy movie, but as you can tell from the trailer, it may have just been too gory for basic cable. Now, Lionsgate is releasing the movie first in all its uncensored glory starting December 11, with the movie going straight to Digital and On Demand. There will be a couple of bonus features included, which include an interview with the director and some fun behind-the-scenes footage. It might not be March but the Ides are marching.